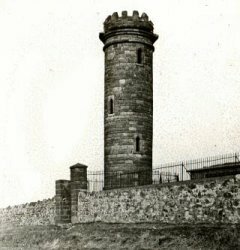 This has been the site of a beacon for over 400 years and a tower was placed there before 1700. The present tower was erected in 1846. Constructed from Gornal sandstone it stands on the crest of Beacon Hill, itself the highest ground in the Manor - 777 feet or 237 metres above sea-level. It is 50 feet high and 7 feet in diameter. The internal steps are in poor condition (in fact the spiral stone staircase has the bottom eight feet missing) and access is barred. The tower's original function and ownership are not clear. The popular story suggests astronomical use by Lord Wrottesley a well known Staffordshire amateur astronomer. However, it is thought a local landowner, Mr. Petit, erected the lookout as a folly! In 1887, for Queen Victoria's Golden Jubilee, a fire was lit in a brazier fixed to the top. The stone column has become an icon in the Manor and featured on the badges of both Sedgley and Coseley Urban District Councils. Today it tops the arms of Dudley Metropolitan Borough Council. Many local organisations use the Grade ll listed building as a logo and the background of the Society's web pages carry an image photographed in 2000. At various times it has been called the 'Monument' and the 'Big Whistle'. Beacon Hill Tenants and Residents Association is keen to see the tower repaired. However, fund raising and grants need to top £150,000 for a successful restoration programme. Financial support for the project has been sought and further publicity for the group's efforts has been provided on the BBC Black Country webpages (including a very nice image gallery). In meetings held during 2009/2010 the Residents Association pushed for more community involvement in the project and acknowledged a wider brief was needed to realise the opportunities Beacon Hill offered. The promotion and protection of all aspects of this open space was taken up by a new group - The Friends of Sedgley Beacon. 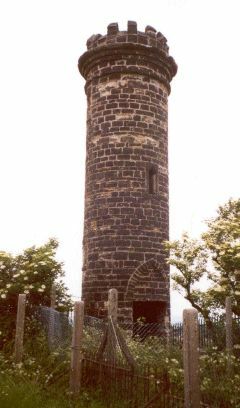 In March 2011 The Friends of Sedgely Beacon website was launched and work continued on a draft management plan. The upper photograph, taken around 1925, can be found in E.A. Underhill's book of poems 'Patchwork'. The image shown here has been copied from Underhill's original glass slide. The central photograph, showing the rear of the tower and the opening to the staircase, was taken by George Blackham in June 2003. 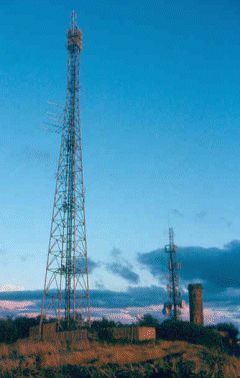 The lower photograph, showing the Beacon tower with it's new companions, (again by George Blackham) in September 2000.